Jotun, from developer William Dubé, stars Thora, a Viking who has died an ignoble death and finds herself in purgatory. There, she must prove herself to the gods by fighting gigantic elemental beasts known as jotun, with the hopes that her victory will prove her worth and allow her to pass into Valhalla. The scale of each jotun is immense in the same way as Shadow of Colossus, with towering enemies that can smash the life out of you, but instead of a 3D environment and colossi, this is a top-down action adventure with hand-drawn animations. Fortunately, your relatively small size allows you to dodge their attacks and use your hefty 2-handed axe to move in and strike quickly, slowly whittling down the monsters’ long life bars. 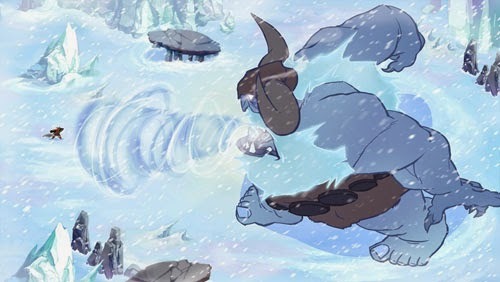 Jotun is now available for PC, Mac, and Linux via Steam.